Ensuring the safety of patrons is one of the most important aspects of running a food service business. Nobody wants to go out for a meal only to take home a bad case of food poisoning. In order to serve fresh and safe food, key hygiene practices must be followed. In our last blog we focused on sanitising fresh produce. This issue we will look into sanitising commerical kitchen surfaces with cleaning products, to ensure that food isn’t contaminated. What does it mean to sanitise? While the terms may sometimes be used interchangeably; cleaning, sanitising and sterilising are actually three different things. For the most part, cleaners and kitchen staff focus on cleaning and sanitising, that is, removing visible dirt, food scraps, grease, oil, etc, and minimising bacteria levels on surfaces, equipment and food. Sterilising is the practise of completely removing all bacteria from a surface and is often used in places like hospital operating theatres where it is important that absolutely no germs are present. How to clean surfaces and equipment? In order for surfaces and equipment to be sanitised, they must first be cleaned. Dirt, grease and food particles can counteract the sanitising cleaning products and stop them from working. Depending on the soil that needs to be removed, different methods for cleaning are used. There are a range of methods available for cleaning items and surfaces in commercial kitchens, please read the instructions below to find the best method for each item. 1. Scrub or wipe down surfaces using a clean cloth or scourer, a solution of dishwashing detergent and warm water in a bucket. Remove all visible signs of dirt/food/oil. Be sure to change the solution regularly or when it becomes dirty. 2. Rinse the surface with fresh water to remove any remaining detergent. 3. Once clean allow to dry. 1. Spray dry surfaces with rinse free sanitiser RF-12 or apply using a cloth or sponge. 2. Keep the surface wet with sanitiser for a few minutes. 3. Rinsing is not required, but treated surfaces should be adequately drained and dry before they come in contact with food again. Clean all items in dishwasher if possible. 1. Before placing items in the dishwasher, scrape off all food scraps into a bin. Any chunks of food left on will land in the filter and compromise the quality of the clean. 2. Knives, forks and spoons should be allowed to soak in a bucket of water before being put through the dishwasher. 3. Stack in a manner that allows the water to reach the entire item. 4. Turn on machine and allow to run full wash and rinse cycle. Commerical dishwashers have dishwashing liquid, such as Agar’s Autodish, automatically dispensed into the machine. 5. Once finished, take out plates and bowls and stack ready for use. 6. Put cutlery in buckets of hot water ready for polishing and storing. Items cleaned in a dishwasher will be sanitised during the rinse phase using heat, providing that the dishwasher is working correctly, has no scale build up and items are stacked properly. 1. Scrape off all visible food scraps into the bin. 2. Fill sink with warm water and add Lift dishwashing detergent. 3. Scrub boards until clean and all visible soil is removed. 1. Scrape off all visible food scraps in the bin. 2. Stack boards in dishwasher so that water can reach the entire item. 3. Turn on machine and allow to run full wash and rinse cycle. Chopping boards cleaned in a dishwasher will be sanitised during the rinse phase using heat, providing that the dishwasher is working correctly, has no scale build up and items are stacked properly. 1. Once dry, spray boards with rinse free sanitiser RF-12. 3. Allow boards to drain so that the sanitiser can run off. 4. Chopping boards should be thoroughly dry before coming in contact with food again. 1. Wipe down machines using a clean cloth with a solution of dishwashing detergent and warm water in a bucket. Remove all visible signs of dirt/food/oil. Be sure to change the solution regularly or when it becomes dirty. 2. Use fresh water and a cloth to remove any remaining detergent. 3. Wash all loose parts in clean dishwashing water or place in the dishwasher if applicable. 1. Spray equipment and loose parts with rinse free sanitiser RF-12 once dry. Be careful not to spray electrical points, dials and buttons. 3. Allow items to drain so that the sanitiser can run off. 4. Items should be thoroughly dry before coming in contact with food again. 5. Loose items washed in the dishwasher do not need sanitising. Clean all items in a dishwasher if possible. 1. Clean all cups and glasses using glass scrubber. To do this, place the glass over the brusher in a warm solution of dishwashing detergent and water and twist it once, twice or until all lipstick, grease and visible dirt is removed. 2. Place cups and glasses on a dishwashing tray. 3. Turn on machine and allow to run full wash and rinse cycle. 4. Once finished, take out glasses and stack ready for use. Cups and glasses cleaned in a dishwasher will be sanitised during the rinse phase using heat, providing that the dishwasher is working correctly, has no scale build up and items are stacked properly. Probe thermometers should be cleaned and sanitised after each use. 1. Clean the thermometer with a cloth and warm soapy water to remove all visible soil and allow to dry. 1. Once dry, sanitise the probe by leaving in a container of boiling water for one minute or dipping in a clean solution of rinse free sanitiser. 2. Allow thermometer to thoroughly dry before coming in contact with food again. 1. Scrape off food scraps into the bin. 2. Pots and pans that are very dirty can be soaked in hot water in the sink with dishwashing detergent. 3. Once water has cooled, scrub pots and pans with a scourer. 4. Rinse the detergent and any soil off the pots then put them in the dishwasher. Pots and pans cleaned in the dishwasher will be sanitised during the rinse phase using heat, providing that the dishwasher is working correctly, has no scale build up and items are stacked properly. Surfaces, kitchen utensils, crockery and equipment can be sanitised using either heat or chemicals. Dishwashers use hot water and steam to sanitise kitchen items during the rinse cycle while sanitisers are more commonly used for larger surfaces such as benches or equipment that can’t be put through a cycle. For both heat and sanitisers to be effective, they must be used in the correct manner. Dishwasher rinse cycles must reach temperatures of 80°C or above and run for over a minute. If you’re using boiling water to sanitise a surface, the surface itself must reach 77°C. The procedure for sanitising surfaces with chemicals depends largely on the type of chemicals used. There are a number of food-grade sanitisers that are commonly found in commercial kitchens including chlorine, quaternary ammonium compounds (QUAT) and alcohol. 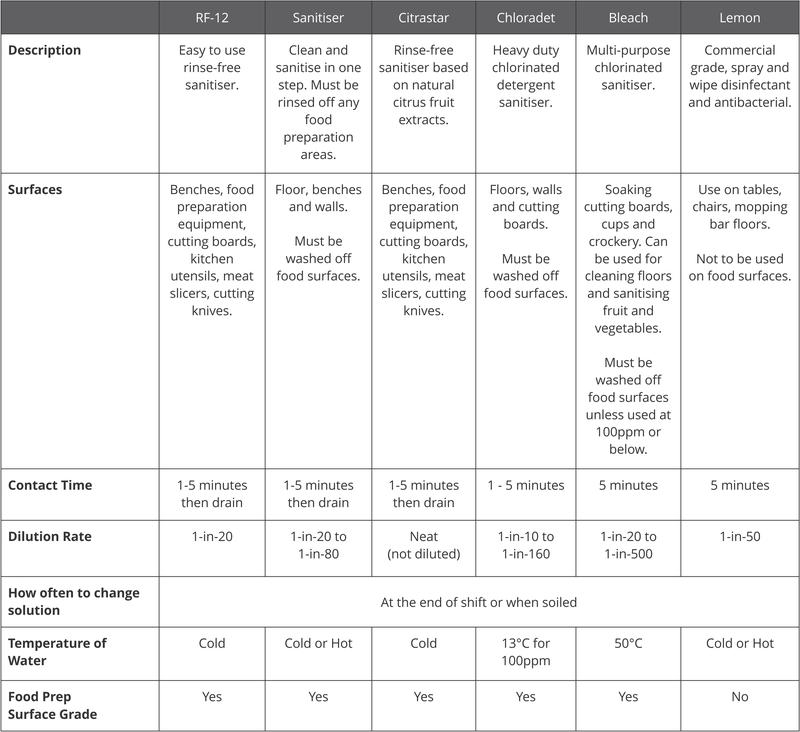 The below chart outlines Agar’s chemical sanitisers for use in commercial kitchens. Further information on each cleaning product and its application can be found on the Product Data Sheets (PDS). To access these on the product pages, you need to log into the Member’s Area. How frequently should you clean and sanitise? Before using a food preparation surface. When changing ingredients or preparing a different type of food. After you’ve finished with a surface or piece of equipment. Clean out dishwasher filters at the end of a shift. Run a cleaning cycle at the end of the day. Inspect dishwashers weekly to ensure all parts are working correctly and no build-up of scale or soil is occurring in hard to reach places. Reusable cloths should be washed in hot water, detergent and sanitiser at the end of every shift. Cloths that become dirty during a shift should be put into a washing basket to be cleaned later. Use a combination of washing powder and sanitiser, such as Agar’s Flair and Safety Bleach to clean and sanitise in the wash.
Have a ‘keep clean’ policy in place. Create a schedule to keep track of when items must be cleaned and tick them off when completed. Remember to prevent cross-contamination by never placing ready-to-eat food on any surface that held raw meat, poultry, seafood or eggs. Wash your hands! Don’t contaminate food with poor personal hygiene. Wash hands frequently, before handling food, when changing ingredients, after a break, eating, going to the toilet, smoking, touching your skin or hair and don’t work while you are sick. Wear gloves and glasses when handling or diluting concentrated chemicals, using chlorine or caustic based products. More info on Personal Protective Equipment (PPE) can be found on the product SDS. Make sure you are trained in chemical safety training and have read the cleaning product’s SDS prior to handling it. Disclaimer: All data and information provided on this site is offered as a guide only. Agar Cleaning Systems makes no representations as to accuracy, completeness, currentness, suitability, or validity of any information on this site and will not be liable for any errors, omissions, or delays in this information or any losses, injuries, or damages arising from its display or use. All information is provided on an as-is basis.